Indawgyi is Myanmar’s most important wetland site and under consideration as a biosphere reserve and a Natural World Heritage Site by UNESCO for its global biodiversity value. Myanmar’s timber is worth about $550 million a year on the international market, according to the World Bank. A country-wide logging ban has increased concerns over illegal logging activity in certain parts of the country. The domestic energy market that uses timber for fuel is a key driver of deforestation in Myanmar, particularly in the region of Indawgyi. KACHIN STATE, Myanmar – At Indawgyi Lake in Myanmar’s northern Kachin State, morning shorebirds flutter lazily above the water hyacinths, fishermen take long siestas after noon and, at night, fireflies float about in utter darkness like lost, fallen stars. Life moves slowly at Myanmar’s largest lake but in the mountains just beyond its shores buzzes a flurry of both destructive and illegal activity. 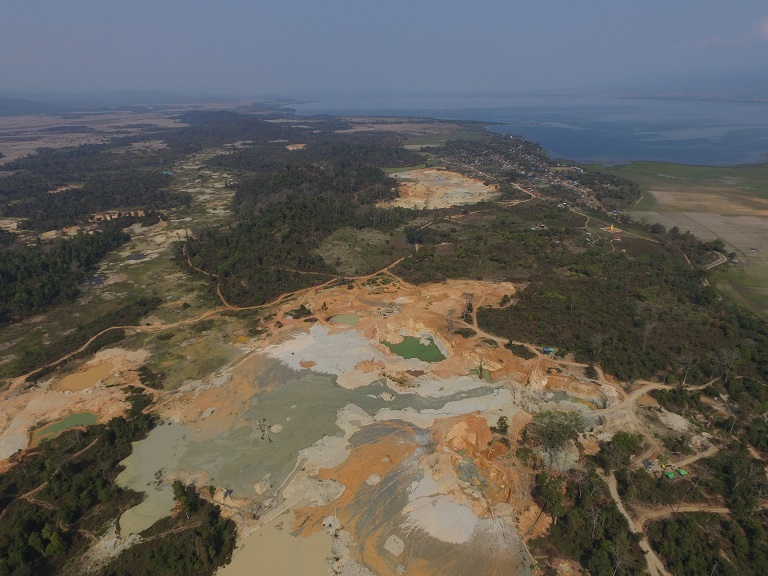 Along with dozens of unregulated gold mining operations south of the lake, there churns an illegal logging industry in the northeast which local conservationists say is ravaging forests inside Indawgyi’s wildlife sanctuary. The trade, which targets both larger hardwoods and smaller trees inside the sanctuary, is local. It feeds into a domestic market for timber and firewood. According to the UN’s Food and Agriculture Organization (UNFAO) wood is the most commonly used fuel source in rural Myanmar – much of which remains off the electrical grid. Much of Myanmar’s timber is lost to international trade, mostly to India and China, and is worth $550 million a year according to recent World Bank figures. But the problem at Indawgyi is a domestic one. “It’s an important part of the picture of what the drivers of deforestation are. Logging is not only for the international trade but for the domestic energy market,” said Frank Momberg, Myanmar country director at international conservation NGO Fauna & Flora International (FFI). Since 2010, FFI has been working at Indawgyi, collecting information on the biodiversity of the area as well as running conservation programs. There are over a dozen Community Forestries (CFs) around Indawgyi that were set up by FFI. 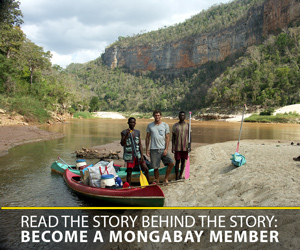 Through the CFs villagers monitor tracts of forestry resources beyond the sanctuary. Indawgyi Lake, located in a wide valley in Myanmar’s restive northeast Kachin State, has long been an isolated destination. Until recently it was accessible only by unpaved mountain roads. A long simmering war there between the Kachin Independence Army (KIA), one of Myanmar’s largest ethnic armies, and Burmese government forces has also kept visitors away. Indawgyi’s 284-square-mile wildlife sanctuary, officially designated in 2004, encompasses the entire lake, its wetlands, and large areas of evergreen and deciduous forests in the surrounding mountains. Logging of any kind is prohibited in its forests, which are rich in biodiversity, home to gaur, sun bear, rare birds and gibbon species. The sanctuary is currently under review to become a UNESCO biosphere reserve. In February the lake was added to the Ramsar List of Wetlands of International Importance. But illicit logging, which has been going on in the wildlife sanctuary for several years, has been increasing recently. GIS imagery collected by FFI shows that logging there ramped up between 2015 and 2016, likely due to a pull-out of ethnic rebels in the immediate area. Aerial images from both years provided to Mongabay clearly show dozens of white specks on the mountains along the northwestern flank of the sanctuary in this year’s photo. The specks indicate areas of tree loss, according to Patrick Oswald, FFI’s GIS Specialist. An on-the-ground investigation by FFI in April found several logging camps inside the sanctuary. The loggers were cutting teak and other varieties of tropical hardwood for firewood and timber using both trucks and elephants for transportation, Momberg says. They were operating in areas that were previously off-limits due to security risks related to KIA movements. However, with KIA troops retreating from the area, the vacuum was quickly filled by illegal logging operations. Skirmishes between the KIA and the Burmese army continue today but farther away from the lake. Still, there are some Burmese army checkpoints along the western side, landmines in the hills, and Kachin rebels are known to make incognito forays into the towns. They come to collect supplies, get rest and appropriate, to the mahouts’ chagrin, the odd pack elephant or two, according to villagers interviewed by Mongabay. Locals stuck between the two armed groups seem to favor neither side. Most come from the Shan ethnic minority and it is a common belief that the sporadic fighting is mostly about money and access to profitable natural resources near Indawgyi and elsewhere in Kachin State. 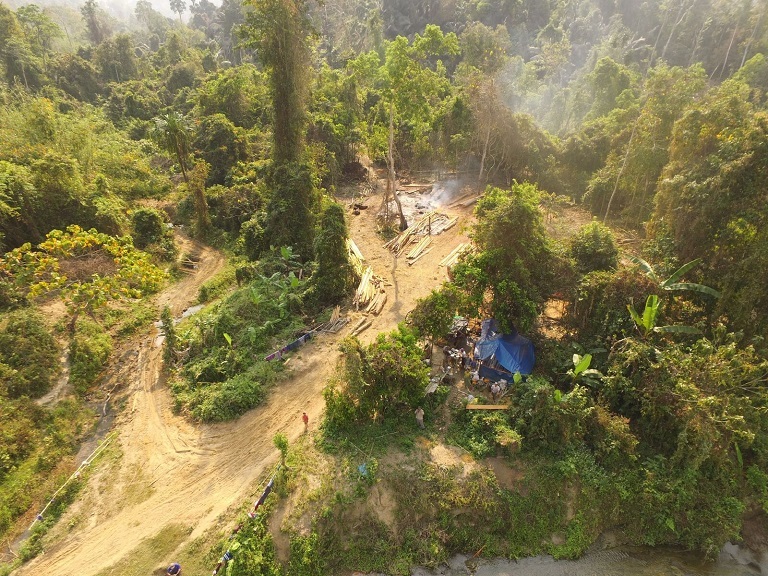 A local village elder from Lon Sant village, whose name has been withheld for his safety, says that it is an open secret that local officials were collecting money from the handful of Burmese businessmen who run the logging operations within the sanctuary. 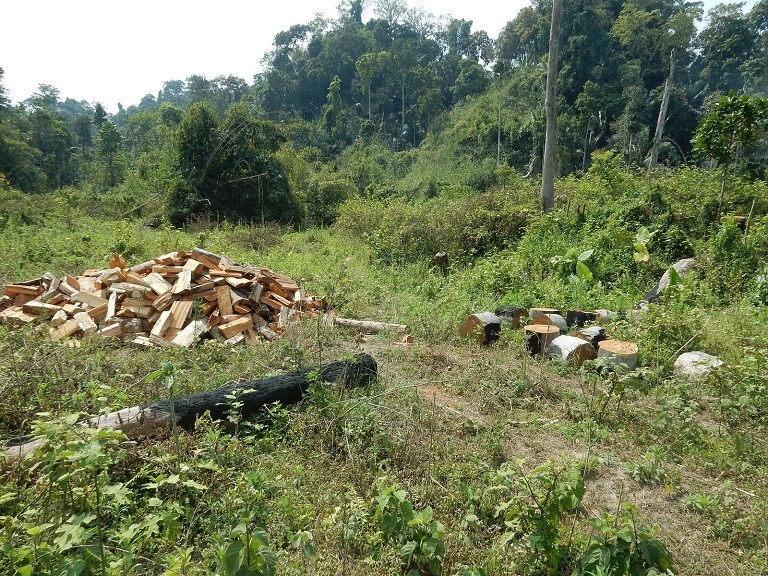 Members of the local community forestry association in Lon Sant who have visited logging camps and spoken with villagers living within the sanctuary say they have learned that one ton of hardwood from the sanctuary sells for about $415. That is also the amount that officials charge per month for loggers to do business in the sanctuary. While villagers claim that they are not aware of the identities of the logging bosses, they do report regularly seeing timber trucks pass through their villages from January to April when there is little rainfall. During those months trucks come and go all day, they say. “There’s not many big trees now,” a villager from nearby Ma Na Hkaw village says, whose identity has been withheld for his safety. However, while logging has caused serious degradation, good primary forest still remains on the steeper ridges providing critical habitat for endangered wildlife, says FFI’s Momberg. Before it became a wildlife sanctuary, Myanmar’s government-owned monopoly Myanmar Timber Enterprise logged the forests around Indawgyi. Only over the last few years have illegal loggers moved in. Myanmar has one of the worst rates of deforestation in the world. Between 1990 and 2015, nearly 15 million hectares of forest cover were lost , says the most recent report from UNFAO. 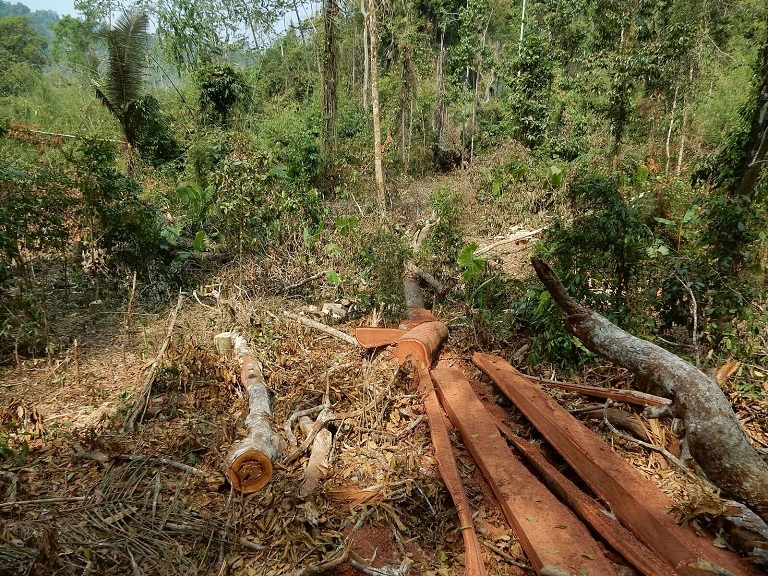 Today there is an average eradication of 185,000 hectares of forest annually in Myanmar, according to a 2015 report by the Environmental Investigation Agency. To curb deforestation, the new government that came to power democratically in March initiated a countrywide year-long ban on logging for the 2016-17 fiscal year. The ban is set to end in early 2017. In the heavily forested Bago Yoma mountain range in Myanmar’s northwest, the ban is set for a decade. Other efforts to cut back on logging are more localized. At Indawgyi, the government has provided free transformers and built power lines in several of the villages around the lake, including Lon Sant and Ma Na Hkaw, in part to lessen reliance on wood burning. But according to community CF leaders, the high costs of connecting households to the grid – around $230 to around $390 – have kept most villagers from the luxury. That means that for the foreseeable future local timber will remain the go-to fuel source. FFI and the Forest Department have also distributed firewood saving stoves and supported tree nurseries for local CF groups to provide alternative sources of firewood, but it will take several years even for fast growing firewood tree species to mature. In February this year, Myanmar’s Forest Department appointed new Widllife Sanctuary Warden Maung Win, who is committed to tackling forest crime, according to FFI. After FFI’s visit to the logging camps inside the wildlife sanctuary, Momberg took the photographs to high-up officials in the Forestry Department in both the state and national capitals. In response to FFI’s evidence Warden Win initiated an immediate crackdown, confiscating one sawmill and disabling another. 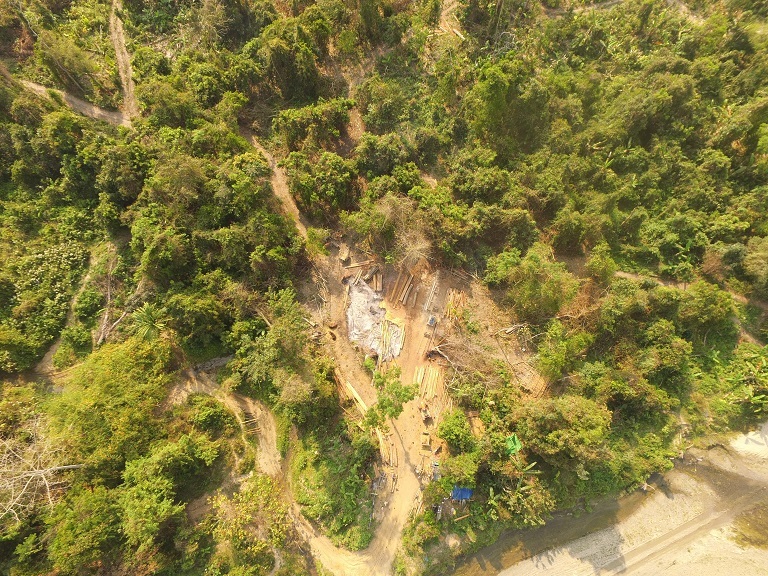 It remains to be seen whether officials will take efforts to prevent logging in the upcoming logging season at Indawgyi, which is fast approaching.